Glass and steel makers produce large amounts of wasted heat energy at high temperatures, but solid-state thermoelectric devices that convert heat to electricity either don't operate at high enough temperatures or cost so much that their use is limited to special applications such as spacecraft. MIT researchers have developed a liquid thermoelectric device with a molten compound of tin and sulfur that can efficiently convert waste heat to electricity, opening the way to affordably transforming waste heat to power at high temperatures. 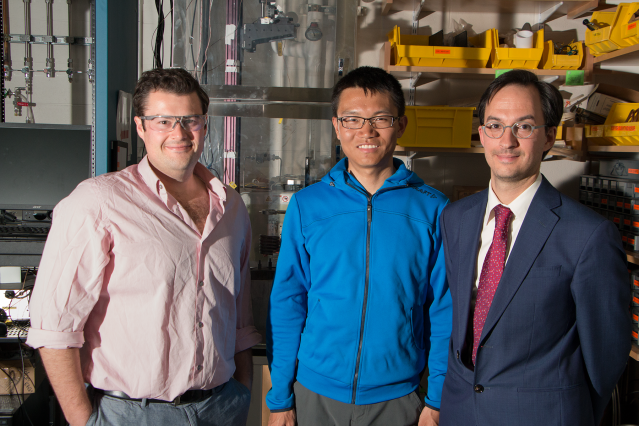 Youyang Zhao, a graduate student in assistant professor of metallurgy Antoine Allanore's research group, built a thermoelectric test cell that operates in a liquid state at temperatures from 950 to 1,074 degrees Celsius (1,742 to 1,965 degrees Fahrenheit). Commercial thermoelectric devices, based on materials such as solid-state bismuth telluride, operate at about 500 C, and a block of bismuth telluride costs in the neighborhood of 150 times more than tin sulfide per cubic meter. Once melted, tin sulfide provides a consistent thermoelectric output over a wide temperature range up to 200 degrees above its melting point of 882 C, says Zhao, first author of an ECS Journal of Solid State Science and Technology paper, "Molten Semiconductors for High Temperature Thermoelectricity," with Allanore and recent graduate Charles Cooper Rinzler PhD '17. Zhao found no significant performance drop as he cycled the device up to 1,074 C and back down to 950 C over several hours. "For me, I first heat up the sample to its melting point and then scan the temperature up to 200 C above melting and then scan back while doing multiple measurements during the heating up and the cooling down part. What we found is the property is fairly consistent," Zhao says. Zhao's thermoelectric device operates in conditions that are relevant to industrial applications, while the material he used, tin sulfide, is appealing from a cost perspective, Allanore says. Thermoelectric devices work by sandwiching together materials that produce an electric voltage when there is a temperature difference between their hot and cool sides. In reverse, they can be used as cooling devices turning an electric current into a temperature drop. Such devices are used, for example, to heat and cool seats in luxury car models and to power on-board electronics on spacecraft on long journeys (using a nuclear energy source and with specialty devices that can operate at higher temperatures than commercial devices). The environmental benefits that producing electricity from waste heat yields are unlikely to be a primary motivator for glass and steel makers to adopt this technology, Allanore suggests. These operations have to run their vats or kilns at temperatures of 1,000 C or higher to make their products, and they make their profits off those products. But reaching this high heat is a one-time cost. If thermoelectric management of that heat allows producers to operate hotter, which could increase productivity, or to extend the life of their equipment, then they will be more likely to adapt it, Allanore says. "We already know that in the steady state we have 1,000 degrees Celsius at that location," he says. And that's enough to melt the semiconducting materials in a liquid thermoelectric device. "At the beginning we thought about how do we implement at large scale, on high-temperature metallurgical furnaces, materials that could recover waste heat. That was our first idea. But then the second vision of this is to say, what can I do with that electricity? Because you're not going to deploy that to make electricity, you're going to deploy that because you have a true benefit to your production," Allanore explains. Being able to manage heat at very high temperature thanks to electrically active materials like molten compounds is one benefit that is now a possibility. These findings can have a large impact on metals producers who already handle hundreds of thousands of tons per year of copper sulfide, iron sulfide, and similar materials in their molten state, but who don't currently take advantage of the materials' semiconducting properties. "We know how to handle these things at very large scale," Allanore says. In 2013, Allanore and John F. Elliott Professor of Materials Chemistry Donald R. Sadoway developed an inexpensive alloy of chromium and iron to serve as the anode in producing steel through molten oxide electrolysis. The process produces metal of high purity and releases oxygen instead of carbon dioxide, which is a major contributor to the greenhouse gas effect. An MIT spinout company, Boston Electrometallurgical Corp., grew out of that work, which has demonstrated molten metal production at the scale of several hundreds pounds per day. The new work on thermoelectric devices under similarly high temperatures provides experimental confirmation of Allanore lab colleague Rinzler's work explaining the theoretical basis for semiconducting behavior in metallic compounds in their hot, liquid state. Rinzler's work lays out a predictive framework for quantifying the energy profile (thermodynamics), chemical structure (configuration of atoms), and electronic behavior in certain liquid semiconducting compounds, such as tin sulfide or copper sulfide. "It's not a simple matter of just saying what temperature range can you operate under? It's what can you achieve under practical conditions of operation that matter for the application at hand and at what cost point of material and device," Rinzler says. "The beauty of something like this is we that can capture both, we can improve waste heat collection, which we may care about from an energy savings perspective, but industry is encouraged to use it because it actually benefits them in the context that they care about directly as well," Rinzler says. Measured on a dollar-per-watt basis, Allanore explains, molten tin sulfide devices could be important to industries that operate at high temperature. "The dollar per watt, when you have large surface area, is dictated by the cost of your material," he says. Other advantages of the proposed system include the simplicity of handling tin and sulfur, the semiconducting mixture's relatively high electrical conductivity and relatively low toxicity compared to compounds such as tellurium and thallium or lead and sulfur. Zhao moved from concept to working device within a year, remarkable progress for scientific research, Allanore notes. "First, it's Youyang, who is very good, and second it's the liquid state ... that makes this type of fast demonstration possible," he says. Zhao earned his BS in materials science and engineering from Georgia Tech in 2013. "The liquid state is very forgiving of large temperature changes in a way the solid-state is not. If you think about a solid-state material that is going through such a range of temperature, you always have thermal expansion, mechanical problems, corrosion," Allanore says. These phenomena prevent many solid materials from being reversible in the sense that as the temperature goes up and down, the performance will remain the same. "This is again one of the features of the liquid state. We call it self-healing," he explains. "As long as you don't change the chemical composition macroscopically, you just get the same material. From an engineering standpoint and adoption for large-scale application, this is a very important feature." "I think people are afraid of it, in a sense, because it seems dangerous to be hot and molten, but once you are molten and know what you are doing, it's very forgiving," Allanore says. For their experimental device, the researchers adapted a concentric cylinder design similar to one used by the late Robert K. Williams, a longtime metal and ceramic division researcher at Oak Ridge National Laboratory in Tennessee, for a 1968 study of thermal conductivity in molten silver sulfide. "They proved convection is a really important factor in liquids," Zhao says. "And for us, we are designing a device. We are not just talking about the properties of the material. We have to consider the cell geometry and design. When you put a novel material into a device, the overall property might be different from the material itself. So that means it is the overall liquid property, possibly with effect from convection, that dominates the performance of the device." Researchers compare different thermoelectric materials by determining their "figure of merit," which is a measure of each material's effectiveness at thermoelectric conversion. 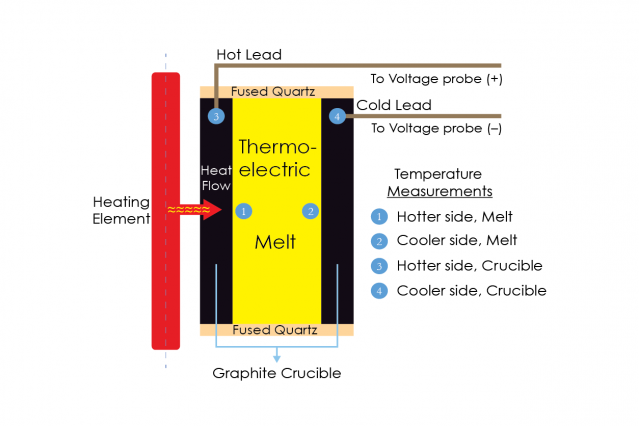 For many potentially useful compounds at high temperature, Allanore says, the thermoelectric figure of merit has never been investigated, so the new device also provides an experimental framework to evaluate this. The thermoelectric figure of merit for a device is slightly different than that of the thermoelectric material it uses because of effects from natural convection as well as interference from the device itself. In the paper, Zhao says, "We reported the figure of merit of the device, not necessarily for the material, because we believe there is a contribution, or there is a performance degradation, from natural convection. In that sense, if we could minimize natural convection, the figure of merit for this device could go up." "That is the next step for our study," Zhao says. "Currently I am trying to study what is the effect of natural convection on either [the] Seebeck coefficient [a measure of a material's strength at converting heat to electricity] or electrical conductivity or thermal conductivity." The MIT researchers have filed a provisional patent application for certain aspects of their work. "Allanore's work is unique for its use of the liquid form of solid semiconductors to convert heat to electricity," says Michael Chabinyc, University of California at Santa Barbara professor and associate chair in materials, who was not involved in this research. "The properties of liquid semiconductors have previously been studied, but his work translates this fundamental knowledge into a practical application. An important aspect of the work is the use of earth-abundant materials that provide a potential pathway to recover energy wasted as heat in an economical manner." Allanore hopes the work will broaden understanding of molten compounds. Unlike in solid materials where atoms are relatively fixed, he says, atoms in liquids vary in arrangement on a scale of several micrometers to several millimeters. One might think, for example, of the difference between the water molecules in a block of frozen ice versus those same molecules in a pot of boiling water. "In a molten material, you have constant movement, and it's a complexity that it is not present in its solid state and is not described by existing models of the materials science we teach in class," Allanore says. "We are comfortable that one day we will bridge the two and then it will be a full story that speaks not only about the electronic structure and property, but also what we call physical chemistry, which is viscosity, density, diffusivity—all these phenomena which are essentials to the liquid state." The first application that comes to mind is steel production in places where electricity supplies are not reliable - like Pakistan. If overall mill requirements are reduced that could lead to less trouble from load shedding. Waste heat to electrical conversion is a big deal no matter what temperature is involved in the recovery. It would be great if someone solves this problem in the temperature range for coal and gas power plants, where available cooling water is a serious constraint.